Below is the rush transcript for "This Week" on February 2, 2014 and it may contain errors. Super Bowl security alert, new plans in place for the year's premier game. Breaking details on law enforcement's biggest worries. Plus, Christie's crisis. New Bridgegate allegations. So what did the governor know and when did he know it? BARACK OBAMA, PRESIDENT OF THE UNITED STATES: America does not stand still and neither will I.
STEPHANOPOULOS: Did President Obama start his comeback at the State of the Union? What can really get done right now? UNIDENTIFIED FEMALE: On January 1, we tripled our sales. STEPHANOPOULOS: The stunning impact of legal marijuana. Is it safe? And is it coming to your state next? Republican leader Paul Ryan, the powerhouse roundtable and our team of experts take it all on right here this Sunday morning. STEPHANOPOULOS: Hello again, packed show this Super Bowl Sunday so let's get right to our top story. Unprecedented security at the big game. That's a live shot you see of Times Square and MetLife stadium. Law enforcement officials locked in saying these next few hours posed the greatest danger. ABC's chief justice correspondent Pierre Thomas tracking everything being done to block an attack. This is the Super Bowl of security. Think about it, the nation's biggest event located at the country's number one terror target: the New York City region. No specific threat has been identified, but we're about to enter into a critical phase for police -- the hours leading to the big game. THOMAS: This morning, MetLife Stadium is a fortress, but for the next few hours the attention of police will turn to the softest, most vulnerable target -- fans streaming to the Super Bowl by mass transit, tens of thousands traveling by subways and trains. Specialized units with the NYPD and TSA viper teams will be checking anyone with bags. At this staging area, bomb sniffing dogs and sophisticated radiation and X-Ray machines scan for explosives and weapons for every delivery to the big game. UNIDENTIFIED MALE: Everything, sir. Even seat cushions. THOMAS: On the waters today, State Police patrols. There are SWAT teams and units to hunt for weapons of mass destruction all to protect the thousands of fans in the 10 block NFL fan zone in Times Square and the Super Bowl. There are even supersonic F-16 fighter jets to protect against threats in the sky. I saw firsthand when I suited up to go along on a training mission with the New Jersey air national guard. In this exercise, a team of three F-16s is told to intercept this Cessna headed toward the big game. The fighter jets will shoot down any threat from the sky. We spoke to New York City's top two law enforcement officials about what they fear most. UNIDENTIFIED MALE: An event like this, you know, the person that we don't know about who comes out of nowhere who wants to make a statement. THOMAS: The Boston Marathon bombings were a painful reminder that anything can happen even during fun and games. For This Week, I'm Pierre Thomas, ABC News, New York. 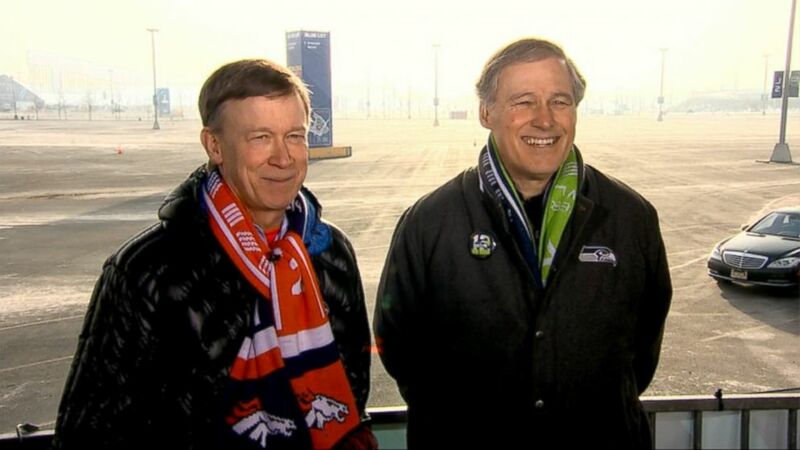 STEPHANOPOULOS: And we move now to the two governments most at stake tonight, John Hickenlooper from Colorado for the Broncos, Jay Inslee from Washington for the Seahawks, both at MetLife today. And Governor Hickenlooper, security first. Are you satisfied everything is safe? HICKENLOOPER: Oh, yes. I think they've done everything you could possibly do. We did the Democratic convention in 2008, which is another one of these level one security events, and you just have to put in the time and the effort. And they clearly have. STEPHANOPOULOS: Were you consulted, Governor Inslee? INSLEE: Yes, I'm very confident in our security. Thomas, Chancellor, Sherman, they've got a total interception (inaudible) so we got good security. STEPHANOPOULOS: Well, you go right to the game, Inslee. You're feeling good about the defense. INSLEE: -- we're concentrating on out here. STEPHANOPOULOS: Governor Hickenlooper, how about Peyton Manning? Is he going to make history today? HICKENLOOPER: Well, Peyton Manning already has made history. I think he's going to add to his history. You know he is one of those people that it's not just what he does on the field, but what he does off the field that's so incredible. And he's become I think an inspiration for this -- for Colorado. We had the floods, we are rebuilding roads, we had to hurry,, hurry, you know get people back in their houses as quick as we could. STEPHANOPOULOS: So you're confident, Governor Inslee. What are you betting? INSLEE: You know, we don't have a particular bet, but we have honored our two states -- Governor Hickenlooper has named his 14,000 foot peaks over individual Broncos. But we're kind of more of a team oriented team, so we've named Mount Ranier, Mount Seattle Seahawks because we kind of think team in our state. STEPHANOPOULOS: I know you guys are going to have a lot of fun tonight. You're of course looking forward to it as well. Before you go, you know, later in the program we're going to be bringing a panel of experts on this whole issue of legalizing marijuana. Your two states are in the forefront of that right now. Governor Hickenlooper, let me begin with you. You opposed to referendum, but a few weeks into the experiment are your fears being realized? And what's the biggest challenge going forward? HICKENLOOPER: Well, I think that, again, anyone who opposed it -- and there are a lot of good reasons to oppose it -- we now have I think an obligation -- the voters passed if 55-45 -- to make we do it properly. And I think that means we make sure kids under the age of 21 don't get it. A lot of those top scientists think that you can lose long-term memory if you're taking this high THC marijuana. I have to make sure people are driving when they're high. You know, make sure that we regulate it like we do alcohol, right. That we have the resources necessary to keep it out of the hands of kids and keep our community safe. STEPHANOPOULOS: And Governor Inslee, your sales start later this year. You're learning anything yet from the Colorado experience? INSLEE: Yeah, a little bit. I think ours states are doing a good job of having a very well regulated market. Both our governors are very interested in making sure we educate our kids about some dangers associated with this like with alcohol. And I think -- I think things are going well in both states. And I want to give a (inaudible) to the Obama administration who has been working, I think, in a very responsible way in allowing the states to move forward. States are the laboratories of democracy throughout American history. And I think we are now looking for a new approach to this issue. So I think both things are going well. And I do want to say that we want to have a well regulated system. And it is going to be that in both states. I think we're both going to achieve success here. STEPHANOPOULOS: Good luck with that. And have fun tonight to both of you. Thank you, gentleman. Now to those new travels for the host government of the Super Bowl, New Jersey Chris Christie confronting potentially explosive charges from a key witness that he wasn't telling the whole truth at that marathon press conference on the Bridgegate scandal. Christie pushing back hard overnight. And ABC's Reena Ninan has all the latest. NINAN: After a potentially explosive claim from a former ally, former Port Authority official David Wildstein who alleges Christie knew about those lane closures that brought traffic on the George Washington Bridge to a standstill in September. In a letter Friday, Wildstein's lawyer wrote, "evidence exists tying Mr. Christie to having knowledge of the lane closures during the period when the lanes were closed." But Christie's office is fighting back, sending an email to supporters Saturday obtained by ABC News attacking Wildstein's background and credibility. The message concludes, "David Wildstein will do and say everything to save David Wildstein." And the statement repeats Christie's claim that he had no involvement in the lane closures. CHRISTIE: I had no knowledge of this, of the planning, the execution or anything about it. And that I first found out about it after it was over. NINAN: But the investigation continues. On Monday, newly subpoenaed documents are expected to be turned over to the state legislative committee examining the traffic scandal. While Christie has not bee subpoenaed, much like the final score of tonight's game, his political future is still unknown. For This Week, Reena Ninan, ABC News, New York. Now let's bring in our headliner, top Republican congressman, former candidate for vice president, Paul Ryan. Thank you for joining us this morning, congressman. Lots to talk about -- the fallout from the State of the Union, legislative battles ahead. Let's begin with these new charges against Chris Christie. You see the Democrats already out with an online ad this morning. With all these investigations swirling around him, are you confident he can continue to run the Republicans Governors Association and be an effective spokesman for your party? RYAN: I am confident. I consider Chris Christie a friend. I think he's been a fantastic governor. Right now, all we know is one person's word against another. You can't base any conclusion on such a thing. And so unless something else is known or made clear, I don't see why you would change what's going on right now. I don't think he should step down, because nothing has been proven. And you always give a person the benefit of the doubt in those kinds of situations in my judgment. STEPHANOPOULOS: OK, let's turn to the president's State of the Union this week. He called for congress to act, but also made it very clear that he would use executive orders to advance his agenda. Let's take a look. OBAMA: Wherever and whenever I can take steps without legislation to expand opportunity for more American families, that's what I'm going to do. STEPHANOPOULOS: Now you had a pretty tough reaction to this suggesting the president is, quote, "circumventing the Constitution." Do you really think his proposals are unconstitutional? You know, his rate of using executive orders is far behind President Reagan, President Bush, President Clinton. RYAN: It's not the number of executive orders, it's the scope of the executive orders. It's the fact that he is actually contradicting law like in the health care case, or proposing new laws without going through congress, George, that's the issue. STEPHANOPOULOS: So you think he's violating the constitution? RYAN: -- executive orders are one thing, but executive orders that actually change the statute, that's totally different. STEPHANOPOULOS: But if you think he's lawless, circumventing the constitution, are you going to move to impeach? RYAN: No, I'm not -- look, what we -- we have a difference of opinion, clearly, and -- and some of these are going to get fought out in court. You have some court challenges with respect to religious freedom going to the court this spring. But I am concerned about this trend, such as what he said at the State of the Union, that if Congress doesn't give me the law I want, I'm going to go do it myself. That's effectively what he said. That is not the way our constitution works. And by the way, when we get sworn in, whether it's a president or a congressman, you swear to uphold "The Constitution." And I think these executive orders are creating a dangerous trend which is contrary to "The Constitution." STEPHANOPOULOS: Listening to both you and President Obama, on the other hand, this week, it does sound like you could have a meeting of the minds on immigration, reach a compromise on immigration reform, one that opens a path to citizenship to for the undocumented, but doesn't necessarily guarantee nothing -- doesn't necessarily have a special path for the undocumented. But this talk of compromise has unleashed a furious debate inside your own party. I want to show you what Bill Kristol wrote in "The Weekly Standard" this week. He said, "Bringing immigration to the floor ensures a circular GOP firing squad instead of a nicely lined up one shooting together. And in the (INAUDIBLE) of ObamaCare and other horrors of big government liberalism, since there's really no need to act this year on immigration, don't -- don't even try." RYAN: Well, look, we don't know who's coming and going in this country, George. We don't have control of our border. We don't have control of interior enforcement. You just talked about the Boston bombers. And so doing nothing on the security side of this, we think, is not a responsible thing to do. It's appropriate you brought this subject up after talking about these executive orders. Here's the issue that all Republicans agree on -- we don't trust the president to enforce the law. So if you actually look at the standards that the Republican leadership put out, which is security first, first we have to secure the border, have interior enforcement, which is a worker verification system, a visa tracking program. Those things have to be in law, in practice and independently verified before the rest of the law can occur. So it's a security force first, non-amnesty approach. The other concern that people have in our party is they don't want to see us get into conference with the Senate and then -- and then compromise to a bad law. We won't let that happen because we've already said we won't go to the conference with the Senate. And so this is not one of those issues where it has some kind of a deadline behind it, like, say, a government shutdown, which forces us into a compromise we might not like to take. This is a here are our standards, this is our approach, if you want to do it this way, this is what we're willing to do. And we're still having a debate in our caucus about even that. But we don't think that we can allow this border to continue to be overrun. And if we can get security first, no amnesty, before anything happens, we think that's a good approach. RYAN: This is not a trust but verify, this is a verify then trust approach. STEPHANOPOULOS: Bottom line, can you put something on the president's desk this year that he can sign? RYAN: I really don't know the answer to that question. That is clearly in doubt. It depends on whether they're willing to actually secure the border, actually have interior enforcement and not -- and agree to not having an amnesty. If we can do that, where it's security first, no amnesty, then we might be able to get somewhere. But I just don't know if the -- if that's going to be the case or not. STEPHANOPOULOS: Let me also ask you about the debt limit. The president made it clear again this week that there's no way he's going to agree to anything but a clean debt limit. It's the only thing he is going to sign. You and members or your caucus are still talking about attaching some policy changes to the debt limit. Is there any reason to think that can succeed? RYAN: Well, I think that we've had -- well, we have had policies attached to the debt limit before. That's actually more the case than not. Usually, what a -- whoever a president is, whoever is running Congress, there is policy attached to the debt limit. So that's -- that's not a new idea. What we don't like is this idea of continually rubber-stamping debt limit increases without acknowledging the problem that got us into debt in the first place. The challenge we have is this president has never proposed to ever balance the budget, let alone pay off the debt. He's been fiscally reckless, in our opinion, and we think we should take some steps in the right direction. And the thing is, we know that there are Democrats who agree with us in the Senate. And so we'd like to look at what are those things we can do to take a step in the right direction, with jobs, the economy, getting this deficit under control, while we deal with the fact that our deficit is out of control. STEPHANOPOULOS: But as you know, the president is not going to sign that. I want to ask you a final question about some recent comments you made about Pope Francis. You praised him for taking on the debate about poverty, but also seemed to dismiss his pretty piercing critique of capitalism, suggesting he really doesn't understand it. This is what you said to "The Milwaukee Journal." "The guy is from Argentina. They haven't had real capitalism in Argentina." Was that a little too flip? RYAN: No, not at all. I think they have crony capitalism in Argentina, where you have real exploitation. That is not the free market. That's crony capitalism. And we -- we're starting to see some crony capitalism here in America. What I -- what I'm excited about the pope's comments is he is inviting a debate. He's not settling the debate, he's inviting the debate. And he is asking lay Catholics to say how we would actually tackle these problems and bring the poor in, stop isolating the poor. These are good things. I think he's -- he's starting a fantastic debate. And if you look at his comments very closely, he always talks about the welfare mentality. He always talks about the welfare state and how we have to avoid creating a welfare state. Bring the poor in, create upward mobility and free enterprise that gives opportunity to everybody, no matter who they are and where they are in life and in America. That's what we're for. He's invited this debate and I think it's a fantastic conversation we're having. STEPHANOPOULOS: But you don't think he'd endorse your budget, do you? RYAN: Of course not. I don't think -- he's a pope. Pope's don't endorse budgets. RYAN: Popes say, let's have a conversation about how to fix the broken status quo, how to bring the poor in, how to not have the welfare state and how to produce upward mobility. Popes don't endorse actually legislative changes or budgets like that. STEPHANOPOULOS: Congressman, thanks for your time this morning. It's going to be an interesting debate. STEPHANOPOULOS: Up next, the powerhouse roundtable weighs in on all the fallout from the State of the Union. And Hillary Clinton stratospheric polls. Plus, a new twist in the Amanda Knox trial and will the State Department be forced to return her to Italy? And later, the grand debate over legal marijuana now playing out all over America. Our team of experts tackles the tough questions. STEPHANOPOULOS: And coming up, can Chris Christie recover from this weekend's latest salvo? The roundtable is ready to take on the week's politics in just over a minute. BARACK OBAMA, PRESIDENT OF THE UNITED STATES: Let's make this a year of action. UNIDENTIFIED MALE: And what better way to start a year of action than with an hour of talking? UNIDENTIFIED MALE: President Obama promised to focus on economic growth, education and health care, or as people tuning in put it, oh, crap, it's a rerun. UNIDENTIFIED MALE: He made a number of proposals. Of course, though, since Republicans control the House, it's unlikely that anything will come of them. UNIDENTIFIED MALE: He made a number of proposals. Of course, though, since Republicans control the House, it's unlikely that anything will come of them. Proposals on "The Bachelor" have a better chance of working out. STEPHANOPOULOS: Late night on the president's speech this week. Let's bring in our (INAUDIBLE) "Roundtable" of ABC News contributors now. Two newest members of our team: Bill Kristol, editor of the Weekly Standard; Ana Navarro, Republican strategist; along with Matthew Dowd; Donna Brazile; and Paul Krugman of The New York Times and Princeton. Welcome to you all. And I do want to get to the State of the Union. But we've got to begin with these new developments over the weekend about Chris Christie. We have David Wildstein, appointee on the Port Authority, suggesting that Chris Christie is not telling the truth, saying evidence exists there. Matthew Dowd, you say these new allegations, which prompted a huge response from Chris Christie, mean that it is less likely that Chris Christie will be elected president than Amanda Knox will vacation in Italy. STEPHANOPOULOS: Now isn't that overstating the case? MATTHEW DOWD, REPUBLICAN STRATEGIST: No, of course not. There's no way I would overstate the case. Listen, I think he's in -- I think the governor is in a serious situation. And this memo they put out, they put out this memo basically trashing Wildstein. And in the course of trashing him, they basically brought up the fact that nobody liked him in high school. Any time you do that, to me, it sends a signal that you are very worried about this, you know, very concerned about this, and there is more to this than that. I think, you know, just like Punxsutawney Phil today got out of his hole and saw that there is going to be six months' (sic) more winter, Chris Christie stood up at that Super Bowl thing yesterday, got booed in that. I think he has got a long winter ahead of him. STEPHANOPOULOS: And the key question, of course, raised by Wildstein, Bill Kristol, is that Chris Christie actually knew about these traffic problems in real time, was getting some kind of information. He said evidence exists, suggesting -- now we'll see if it's true or not. That would be a huge blow. ANA NAVARRO, REPUBLICAN STRATEGIST: Since when are you against the Republican establishment? KRISTOL: I'm against the -- I'm from the tea party. KRISTOL: But anyway, the establishment types, I would say the last 48 hours, when you ask them about the Christie situation, they have a two-word answer: Jeb Bush. KRISTOL: I'm serious. I'm really struck by how much Christie was the kind of establishment, donor class favorite, I think, for the Republican presidential nomination in 2016. They are beginning to -- maybe foolishly, but they are beginning to write him off. And I think we will see a big drumbeat of Jeb should get in the race. STEPHANOPOULOS: Meanwhile, Paul Krugman, the Democrats jumping on this hard. I was a little surprised they put out an ad on this. That story kind of runs on its own, doesn't it? PAUL KRUGMAN, THE NEW YORK TIMES: Yes, but it's -- they're having a lot of fun. I think Christie was the one guy that really scared them for 2016. And now it's -- you know. This is wonderful, actually, you know, this whole thing: Wildstein is not reliable, he's scum of the earth, nobody should ever trust him, and by the way, I appointed him to a very, very important policy post. I mean, Christie is in a no-win situation, even if there isn't any smoking gun. BRAZILE: There's a lot of dripping going on, George. And now we know how Chris Christie will deal with those who oppose him. He will do a document dump. I mean, the information that he leaked or put out, his office officially -- (INAUDIBLE) official put out on this guy. I mean, to go back to his high school and say the guy, you know, was deceptive, and he has been unproductive. So appointing to a high-level position, and he was the Chris Christie guy on the Port Authority. Look, the governors are meeting this week in Washington, D.C. I wonder how many governors will take pictures with Chris Christie versus take pictures with Scott Walker or Mr. Kasich or some other governors. I think Chris Christie is in a lot of trouble. NAVARRO: Yes, unlike other politicians, he did an oppo dump on somebody that's talking bad about him. But, look, let's also put this in context. The only new evidence that we have right now is that this guy who, you know, Chris Christie keeps saying was a dork in high school, I think he has got to stop that, because this is turning into "Revenge of the Nerds." Only evidence we have now is that this guy is not going to have Chris Christie's back. You've got a guy who is implicated in the issue, who wants to clear his name, and he is giving all indications that he is going to say whatever he has to say and show whatever he has got to show. So I think that changes the equation. But we have no new evidence in the last three days that he actually knew anything. If that comes out, the situation changes completely for Chris Christie. But today, we are in the same exact spot we were three days ago. We just don't know how this is going to shape up. STEPHANOPOULOS: Well, we also know that David Wildstein is trying to get immunity before he starts to talk, which is significant. OK, so how about that point that Bill Kristol makes there about Jeb Bush? It was interesting to watch Jeb Bush come out and talk about potentially running for president this week. Take a look. JEB BUSH (R), FORMER FLORIDA GOVERNOR: The decision will be based on, can I do it joyfully? Because I think we need to have candidates lift our spirits. It's a pretty pessimistic country right now. STEPHANOPOULOS: He could barely crack a smile when he was saying that, Ana Navarro. You're pretty close to Jeb Bush. Can he do it joyfully? NAVARRO: I think so. And I think that's the question he is asking himself. I've actually heard him talk about this and say this exact answer now for four or five months to his close friends and to other people. NAVARRO: And, you know, when he says, do it joyfully, he wants to have an optimistic, visionary agenda for America, and go out doing it with -- and campaign, which is a rigorous system, a rigorous process, go out and do it with happiness and with joy, and with the desire to do it. STEPHANOPOULOS: Talk about -- back to the (INAUDIBLE). BRAZILE: Well, I was just going to say that now that the right lane is closed on the so-called "bridge to 2016," the center lane is open. But I don't think Jeb Bush can win the Republican nomination, because of the tea party. NAVARRO: You hope Jeb Bush doesn't run -- bring the Republican nomination to (INAUDIBLE) because he's going to be tough to beat. DOWD: To me this is so telling. Listen, Jeb Bush is very qualified, ran a huge state. He has got -- in the Republican primary, I still think the name is very good. There are questions whether or not the name -- the last name still has any penetration capability in a general election. But to me, you watch this thing, there are 330 million Americans. Are we going to basically go and vote between Jeb -- a Bush and a Clinton in 2016? I think so many Americans in the general election are just like, really, we can't -- there is nobody else we can pick from? It has been that way for 30 years. STEPHANOPOULOS: Look at The Washington Post/ABC News poll this week, and Hillary Clinton on the Democratic side, this is unbelievable, 73 percent support. Never seen a number like that in a primary poll. Of course, we're still two years out. I mean, (INAUDIBLE), let me bring this to you. I mean, you start to hear now people really talking about the potential, if she decides to get in, that she will be virtually unopposed. KRUGMAN: Yes, it's a funny thing, you know, Will Rogers on his head. Will Rogers famously said, you know, I'm not a member of any organized political party, I'm a Democrat. And now all of a sudden the Democrats have got all of this unity, and Republicans are all falling to pieces. And it's an interesting thing. I think it's -- actually I think ultimately it comes back -- I haven't said this thing here, it comes back to health reform. It comes back to the fact that the great Democratic dream has actually been pushed through. Republicans think it's going to collapse, but they're deluding themselves. And that means that the party is unified in a way it hasn't been for many, many decades. NAVARRO: I have to tell you, I don't think it's good for Hillary or for Democrats if she is unopposed, because what we saw this week is that Hillary Clinton is rusty politically. When she said in front of cameras that she hasn't driven since 1996, we thought Mitt Romney was unrelatable? This is a woman who hasn't worried about car repairs, about changing tires. BRAZILE: You're in a city where lots of people don't drive every day. They catch subways or alternative transportation. NAVARRO: Well, guess what, though, this isn't a swing state, and this isn't an early primary. DOWD: The other thing that she -- I think is interesting about this, which is ironic, is she was road-blocked in 2008 by Barack Obama, and she couldn't get through the primary to win a general election that most people thought a Democrat was going to automatically win. STEPHANOPOULOS: I want to get to Barack Obama right now. Of course, we saw the State of the Union this week, talking about executive action. Some confrontation, but a little bit less than some people expected. Not putting out a lot of hope for major legislation this year. I guess the big question, Bill Kristol, is, can any of these things that President Obama is calling for make a big difference? And does this lay the groundwork for his comeback strategy? KRISTOL: It was a pretty strikingly uninspired speech, sort of a litany of small liberal ideas, without any overarching narrative or theme. I mean, I actually sat -- I watched it with you there on-set. I thought, I could've written a better speech. I wouldn't have believed it. But if I were a liberal speech-writer, talk about how bad things were when I took over, how much of a disaster Bush was, the financial crisis, 10.8 percent or whatever it was unemployment, we're coming back. I mean, even he could have painted a picture that would have at least put Republicans more on the defensive, honestly. And he didn't even do that. So if you watched it, it was one sort of here's my small liberal idea in job training, and here's my small liberal idea on something else. I don't think it was effective, honestly. STEPHANOPOULOS: (INAUDIBLE) best speech could you have? KRUGMAN: I'm not sure. I mean, I thought that, gee, you know, this is a laundry list of small items, and I'm not interested. But people who, you know, pollsters tell me that actually the public likes laundry lists of small items. But probably because the public doesn't have a sense of what's small and what's big. STEPHANOPOULOS: And they support an increase in the minimum wage. KRUGMAN: That's right. That's a list of a bunch of things that are popular, a bunch of things that, in fact, lots of Republicans support but the Republican Party does not. And so, you know, my view on Obama is basically he has been -- in one sense, he has been a lame duck since November 2010, since Republicans took control of the House, he has been unable to get anything passed scorched earth opposition. On the other hand, his first two years make him the most consequential president in -- you know, since Ronald Reagan. KRUGMAN: -- health care and actually financial reform, which he didn't mention, but it's actually a much bigger deal than most people imagine. So just on the basis of what he has done, all he has to do is hang on there and create the appearance that he's doing something and that's his goal. BRAZILE: (INAUDIBLE) Republicans, when they have nothing else to talk about because they're no more new ideas coming from the Republican Party, they downgrade, you know, modernizing the school. Rebuilding our manufacturing sector. Giving the American people a raise, they call it little small liberal ideas, when most Americans just want to see Washington get something done. UNIDENTIFIED MALE: (INAUDIBLE) about that. KRISTOL: Mike Lee, who gave the Tea Party response -- we ignored because it wasn't on TV and all that -- Mike Lee's speech is more substantive and has more reform ideas and is more candid in discussing inequality. He says we have an inequality crisis. We have a mobility crisis. Here are conservative reform ideas. Mike Lee had more ideas in his Tea Party response speech than Barack Obama. BRAZILE: (INAUDIBLE) job training which President Obama supports. STEPHANOPOULOS: I was most (INAUDIBLE) he talked about immigration reform. Wasn't that the big moral thread, throwing out red meat arguments, said talk about the economic benefits and, Matthew Dowd, it certainly seemed like that was him saying how much do you think I can get this done this year? So I'm not going to go out and be right at the front of this parade. I'm letting the Republican Party start to work it out, signing something at the end. DOWD: What -- I mean it -- I think everybody would love for this thing to happen. But again, I think he's started trying to bet on the reasonableness of certain Republicans in the House or the Senate for this to happen. This issue, to me -- and obviously I worked for George Bush in 2000, was a huge advocate of a pursuit of a Latino or a Hispanic coalition that sort of built the coalition for the future for the Republican Party, and in 2004. The Republicans have a major problem here. It's not as if Hispanic or Latino voters think this is my number one issue and that's all I care about. They care about education. They care about the economy. They care about jobs. They care about national security. They care about all those things. The problem for Republicans is that immigration reform is a gateway issue and basically says you have to do something about that in order for the -- for the -- those voters to listen to you on all those other issues. STEPHANOPOULOS: But Bill Kristol thinks it's crazy politics. KRISTOL: Totally crazy. It's a very bad bill, the Senate bill. To get a bill to the president's desk, you ask Paul Ryan, will there be a bill if it says -- it'll have to be compromised with the Senate Democratic bill. There's no acceptable compromise for conservatives in that bill. So why even try? Republicans will be better shape in 2015. This problem's been around a long time. It could wait another year or two. There's no urgency. It would be foolish for Republicans to bring anything up in the House this year. NAVARRO: I think it's foolish for us to continue with the status quo and I think what you heard from Paul Ryan today and what you've been hearing consistently from John Boehner is we're not going to accept the Senate version. This version's is smaller in scope. Surprisingly this week and smartly this week, Democrats have said they're open to this new version, which does not include citizenship, which is a very tough bill. It's going to be piecemeal, not the one big bill at the Senate. NAVARRO: -- what it's going to be. STEPHANOPOULOS: OK, now, Donna, it does appear that the president's willing to put off citizenship, not forever, but for an awful long time. Can he hold onto his base if he does that? BRAZILE: No, I don't think so. I don't think you can create two classes of citizens in this society, while with legal status on what -- the right to vote and the other without. I think the Democrats are glad to have to look at this so-called piecemeal approach that the Republicans have outlined, the five-step program, whatever they want to call it in their recovery mode now, to try to get the Latino vote back. But the Democrats are going to continue to say comprehensive reform is the way to go. And they'll look at some of these piecemeal approaches in the House to see if that's one way to move the ball. NAVARRO: Look, George, I'm an immigrant. I'm the one at this table who's an immigrant. I was a refugee. I was a legal permanent resident. Today I'm a U.S. citizen. I can tell you most Hispanics -- and Pew has documented this -- you know, most polls will show you that the majority of Hispanics, the majority of undocumented immigrants are OK with the legalization program because it makes such a difference. STEPHANOPOULOS: (INAUDIBLE) to one final issue, Amanda Knox convicted again this week by an Italian court, one more appeal left. But it does raise the question that if this appeals court, Supreme Court affirms the conviction, will she be extradited to Italy? Here's what she had to say about it. AMANDA KNOX, CONVICTED MURDERER: I will never go willingly back to the place where I -- I'm going to fight this until the very end and it's not right. And it's not fair. STEPHANOPOULOS: Matthew Dowd, you wrote a column this week where you said that this is the exact kind of issue that confirms that our biases determine what we think about a policy issue. STEPHANOPOULOS: (INAUDIBLE) after she was acquitted. DOWD: But we've supported that system over the past 70 years, ever since we helped them set up part of it after World War II, is that if you close your eyes and basically say that if an Italian citizen had done the exact same thing, come over here, got convicted of murder, went back over there, we would be screaming for their extradition. I also think it's a bias towards -- she's a very attractive young female. If that was a -- if there was a different demographic in that case, we would be looking at this differently, just like in the Trayvon Martin case, just like in so many other cases, if you close your eyes and switch positions, we'd be thinking something totally different. NAVARRO: Well, I'd say to her, girlfriend, start making up a list of all the -- all the countries that don't have extradition treaties with Italy and start your life. KRUGMAN: No, there's -- and that's a double jeopardy. We can -- we can argue it on technicalities. No, the U.S. doesn't have to argue that conviction was wrong. DOWD: Double jeopardy does not apply in this case. DOWD: I agree it would be an easy out in that case. KRISTOL: I have this old-fashioned view that American president should probably watch out for the well-being of American citizens, especially when they are in the United States of America. I would not send her abroad to face justice, when it's not justice. It's pretty evidently been a very corrupt trial and conviction, I think, in Italy. STEPHANOPOULOS: That's going to be the last word. Let's round this out with our powerhouse puzzler. This week's question comes from Chris Doyle (ph), Super Bowl theme, which president got offers to go pro from the Packers and the Lions. Bonus points if you guess why he turned them down. We're back in two minutes with the answers. STEPHANOPOULOS: And panel, which president received and refused two offers to play pro football down in Brazil? KRUGMAN: Has to be Ford. KRISTOL: I guess I'll go along with them. STEPHANOPOULOS: Be honest. You have no idea. NAVARRO: I am the -- I am the last female holdout in the football (inaudible) club. DOWD: Has to be Ford from my home state of Michigan. He was an all-star at University of Michigan. STEPHANOPOULOS: That's exactly right. He was recruited out of Michigan, but he decided to go to law school instead. We'll be right back with Dr. Richard Besser and our expert panel for the debate over legalizing marijuana. OBAMA: I stand by my belief, based, I think, on the scientific evidence, that marijuana for casual users, individual users, is subject to abuse. But as I said in the interview, the incarceration model that we've taken, particularly around marijuana, does not seem to have produced the kinds of results that we've set. STEPHANOPOULOS: President Obama clarifying his recent comments that pot is no more dangerous than alcohol, comments coming right in the middle of a national debate sparked by the recent legalization of marijuana in Colorado and Washington. Our expert here to take it on. With some background first from ABC's medical expert, Dr. Richard Besser. UNIDENTIFIED MALE: Have your I.D.s ready. DR. RICHARD BESSER, ABC NEWS CORRESPONDENT (voice-over): It's a Wild West weed rush. UNIDENTIFIED MALE: We're seeing the whole world (INAUDIBLE) right now. BESSER: Lines spiral out the door. UNIDENTIFIED FEMALE: It is historic. UNIDENTIFIED MALE: Hollywood, Florida and I'm a teacher. BESSER: They're drawn by the chance to legally buy marijuana, not just medical marijuana, but marijuana just for fun. UNIDENTIFIED FEMALE: You'll be very happy with that. BESSER: And perfectly legal, taxable, almost normal and a huge business opportunity. UNIDENTIFIED MALE: Can you say anything about how business expanded when it went recreational? UNIDENTIFIED FEMALE: Oh January 1, we tripled our sales. UNIDENTIFIED FEMALE: Tripled. And on our second day, on January 2, we doubled. BESSER: This is the largest dispensary in the state so far. UNIDENTIFIED FEMALE: These are our mother plants. This is our flowering room. So after the plant is harvested, it's going to come here into our trim room. In here, we dry that finished buds. BESSER (on camera): This is a big operation. UNIDENTIFIED FEMALE: We're 20,000 square feet right now and we're expanding into an additional 20,000 square feet. BESSER (voice-over): But though voters decided, the country's divided. A recent ABC News/"Washington Post" poll found 49 percent support legal recreational weed, 48 percent oppose. And Denver's mayor, Michael Hancock, is one of them. MAYOR MICHAEL HANCOCK (D), DENVER: Right. BESSER: -- of legalization of marijuana. BESSER: And now you're in charge of making sure it's right. BESSER: How do you reconcile that? HANCOCK: The people have spoken. They've amended our constitution to legalize marijuana in Colorado. And my personal views aside, my job now is to carry froth the regulatory framework and the enforcement mechanisms of this industry in a very responsible and professional manner. BESSER (voice-over): Dr. Paula Riggs has spent the last 20 years researching marijuana addiction in teens. DR. PAULA RIGGS: Brain development is really rapidly occurring from about age 10 well into our mid to late 20s. Your brain is kind of under construction. And it disrupts the development of circuits. And the latest study shows that regular use in an adolescent, is associated with a 6 to 8 point reduction in IQ. BESSER: High school senior Calvin Smelter (ph) started smoking in the eighth grade. CALVIN SMELTER: Before school, during school, after school, at night, again at night, really late at night. You know, I woke up in the morning and started all over again. UNIDENTIFIED FEMALE: His whole life became unmanageable and he couldn't stop. That's an addiction. BESSER: Calvin's parents enrolled him here. SMELTER: (INAUDIBLE) it's my recovery. It's my life. BESSER: A rehab center for teen boys. UNIDENTIFIED FEMALE: Nobody has their first smoke thinking, I want to become an addict. It just sneaks up on you. BESSER: Over a lifetime, 9 percent of marijuana smokers will become addicted. But compare that to the addiction rates for other legal drugs -- 32 percent for tobacco and 15 percent for alcohol. UNIDENTIFIED MALE: All the objective evidence on marijuana finds that it's far less harmful than alcohol. It's -- it's less toxic, it's less addictive. BESSER: Nashan Divert (ph) led the campaign for legalization in Colorado. He says if you allow alcohol, marijuana should be a slam dunk. NASHAN DIVERT: Unlike alcohol, marijuana doesn't contribute to acts of violence and reckless behavior. It's really bad public policy to steer adults away from marijuana and toward drinking. BESSER: The Colorado State Police can test for drinking. For pot? UNIDENTIFIED MALE: There's nothing on the side of the road that can detect this, much like the portable blood test for alcohol. BESSER (on camera): Nothing like a Breathalyzer? UNIDENTIFIED MALE: There's no Breathalyzer for the marijuana. BESSER (voice-over): So instead, officers look for things like a steady horizontal gait, being able to stand on one leg and being able to walk in turn without stumbling. But marijuana arrests aren't just for impaired driving. In 2011, there were 750,000 arrests for marijuana offenses nationwide, most of them for simple possession. UNIDENTIFIED MALE: And I think people get the fact we've spent too many resources incarcerating people or citing people on this. So let's be smart about how we handle it. Let's legalize it, tax it and let's make sure that people are held responsible for the responsible use of it. BESSER: These 22 year olds came to Colorado to snowboard and get high, legally. (on camera): What do you think about it being legal? UNIDENTIFIED MALE: It takes a lot off your -- your shoulders. BESSER: A lot of the pressure? UNIDENTIFIED MALE: Yes, exactly. And you have to see the name, exactly what strain it is. UNIDENTIFIED FEMALE: A lot of people, they've become connoisseurs of the product. So for them, it is about smell, it's about taste, flavor, obviously. BESSER: It sounds like how people describe a fine wine. UNIDENTIFIED FEMALE: Colorado, in a way, is becoming its own little Napa Valley. STEPHANOPOULOS: And let's dig into this now with our experts. Rich is with us, along with Alison Holcomb from Washington State's ACLU, Pierre Thomas back, as well, and Ricardo Baca, the marijuana editor of "The Denver Post," one of the major papers (INAUDIBLE) had that post before. Welcome to you, as well. RICARDO BACA, MARIJUANA EDITOR, "THE DENVER POST": Thank you. STEPHANOPOULOS: -- but it kind of evolved. BESSER: Yes, you know, I'm a -- I'm a parent of two teenage boys. I'm a pediatrician. And I'm very concerned about the impact on the developing brain from frequent use. And so I went into this story thinking there's no way this should be legal. But the more I -- I got into the story, the more I was convinced by the arguments around the comparison between alcohol and its dangers and -- and marijuana. And it's just not rational that adults don't have the choice of using marijuana but they do for alcohol. Marijuana is less likely to be addictive, it's less likely to cause car accidents and birth defects. It's -- it's less likely to cause domestic violence. So how do you rationally say that it's OK to -- to drink alcohol, with that profile, but it's not OK to occasionally use marijuana? STEPHANOPOULOS: How do you do that, Pierre? PIERRE THOMAS, ABC NEWS CORRESPONDENT: Well, it's interesting, I spent some time doing some research, talking to law enforcement officials. And one of the things they point out is that this is not your daddy's marijuana, that the marijuana today is three times more powerful, if you look at the THC, which is the active ingredient. And they're very concerned about the effect on younger people. So that's one of the things they're concerned about. They also say -- they say that you have to look at how is the legal system going to adjust to accommodate this? You saw with the state trooper, there's no way to test for it, really, on the highway. STEPHANOPOULOS: -- in Colorado and it is unprecedented. And I'll have to ask you the first question you probably always get. So do you use it? BACA: I do, yes. I use it both medically and recreationally. Yes. STEPHANOPOULOS: OK, and, but what are you seeing on the ground? I was very struck by one of our observations, you actually can smell the difference in Denver and Boulder? BACA: You can. If you went back a couple of years in the metro area and took a big whiff in downtown Denver, downtown Boulder, you know, it would have been your average city. But now, I think if you're at a Bronco game, if you're out in downtown Denver, you can actually smell the difference. We were at the Justin Timberlake concert just a few weeks ago and you could definitely smell the difference there. STEPHANOPOULOS: What's the biggest challenge so far? You know, it comes down to just keeping it out of kids' hands, but also keeping it from crossing state lines where that Justice Department memo came out saying Colorado, Washington, go for it, but we're watching you. You know, it's just like we have to pay attention to those bits and pieces that are very important. STEPHANOPOULOS: You're part of the campaign in Washington State to have it legalized. This is -- you know, the sort of the forefront of efforts. We're starting to see efforts in other states as well. ALISON HOLCOMB, WASHINGTON STATE ACLU: Right. We are. We're seeing Oregon, Alaska -- California is looking at it. They don't know when they're going with it. I think what you're seeing nationwide is that the conversation has changed from -- does it make sense for us to continue treating this like a criminal matter to how can we do this in a responsible way when we're not only focusing on keeping it out of the kids hands, but maybe we're also providing kids some proactive information to help them make better choices for themselves. STEPHANOPOULOS: ...this week. He made a powerful argument he tried to clarify his arguments where he said, listen, it's just not fair that if you're a young African-American kid you're going to get a far harsher sentence than someone else. But then doesn't that potentially lead to the argument is why not just stop at decriminalization, why go all the way toward legalization? HOLCOMB: I think the concern with stopping with decriminalization is that we do have to address the black market. If we don't address the black market, kids are going to keep getting marijuana that's three times as strong with THC. That's happening outside of any sort of regulatory structure. We need the regulations, we need licensing, we need standards. STEPHANOPOULOS: And the other counter argument to the argument you were making, Richard Besser is, yeah pot may be no worse than alcohol, but once you get a whole lot of money marketing behind it it's going to be impossible -- we've seen it with cigarettes, we've seen it with alcohol, that kids are going to start using it earlier and earlier and potentially get hooked. BESSER: Yeah, and you know I think that that is one area there has to be a lot of focus on regulation. And we'll also have to look really closely at what happens in Colorado and Washington State and learn from that experience. I do worry about kids using this. And we have to be clear in this that it's not a signal saying it's OK for kids to smoke pot. I know in the community we live in, kids are smoking pot without this. And hopefully bringing it away from the black market and bringing it out in the open we're able to get those messages through that way. STEPHANOPOULOS: Is that signal being sent in Colorado? Do you feel that? BACA: It's definitely being sent. And Rich makes a good point. I mean -- in middle schools, this is in high schools, it's everywhere. STEPHANOPOULOS: So you write about that? BACA: I do. Oh, yeah, yeah, we've written multiple times about just the sheer strength of it and good amounts. It's good to start if you're new with 5 milligrams of an edible. It's a very solid way of measuring the amount of pot that you're about to ingest. THOMAS: George, one of the things that has struck me about this whole thing is when you start to look at the marijuana, Americans have had a love affair with marijuana. If you look at the black market, they're trucking it into the country by the hundreds of tons. I went to a private location, secret location where the government disposes of the illegal, the disposing of it by forklift. It's just incredible to see. STEPHANOPOULOS: And it's going to be very hard, Rich Besser, to keep it out of the hands of kids. BESSER: I think it is. I mean, right now it's hard to keep alcohol out of the hands of kids. It's hard to keep marijuana out of the hands of kids. And we need to do a better job around that. And I think a lot of that comes down to parenting. Education in schools is one thing, but it comes down to what are saying at home and what examples are you setting? But this doesn't change that. The fact that it's illegal now, kids are using this. It's rampant. Saying it's legal for adults to use that is I think a rational approach. STEPHANOPOULOS: That is all we have time for. I wish we had more time. I want you all to come back at some point. Dr. Besser is going to follow this up with a Twitter chat Tuesday. All the details in ABCNews.com/health. And when we come back, that presidential trivia for an American hero. Martha Raddatz reflects on his determination and the duties we share after a decade of war. STEPHANOPOULOS: Far and away the high point of Tuesday's State of the Union, what powerful ovation for Sergeant Cory Remsburg so badly injured on his 10th tour in Afghanistan. And after 10 years of war, he is just one in a generation of young men and women who refused to be defined by their sacrifice. Here's Martha Raddatz with their stories and their lessons for us. MARTHA RADDATZ, ABC NEWS CORRESPONDENT: In this divisive political arena, a moment of purity. OBAMA: Sargent First Class Cory Remsburg never gives up and he does not quit. RADDATZ: The young Army Ranger's incredible woe and unbreakable spirit like so many other veterans I have met who never give up. There is Lieutenant Colonel Tim Karcher. LT. COL. TIM KARCHER, U.S. ARMY: Like everything in Iraq, it changes. RADDATZ: Weeks after we were with him on this patrol in Iraq, he lost both legs and nearly his life. UNIDENTIFIED FEMALE: At one point, I had told him it was OK. He needed to let go. I can do it. RADDATZ: Today, he is standing tall on prosthetic legs and still working hard in the army. And Lieutenant Mark Little who I was with minutes after he lost his legs, incredibly in good humor, joking with doctors. He, too, got prosthetic legs. He married his true love and is now raising money for wounded warriors. LIEUTENANT MARK LITTLE, U.S. ARMY: It's just the way I am. It's either with a smile and cry. And you don't accomplish anything by complaining. RADDATZ: Mark, Tim, Cory and their families are all a reminder of those who are good and strong and courageous in our country. We love heroes and we love homecomings like the one you will see tonight during the Super Bowl. UNIDENTIFIED MALE: This was all for you. UNIDENTIFIED FEMALE: Are you serious? Get out of here. RADDATZ: This will be the year of so many reunions as our longest war, Afghanistan, comes to an end. A new focus for our country, taking care of our returning veterans and those already here. UNIDENTIFIED FEMALE: How does it feel to be home, Cory? RADDATZ: Even when the parades, the speeches are over. That is when we should really remember. And now some welcome news from Afghanistan, the Pentagon did not announce any deaths of any service members overseas this week. That's all of us today. Thanks for sharing part of your Sunday with us. Check out world news with David Muir tonight. And I'll see you tomorrow on GMA.